Let's start like this: Provenance is a novel about family, identity, culture, truth, and what it means to belong. 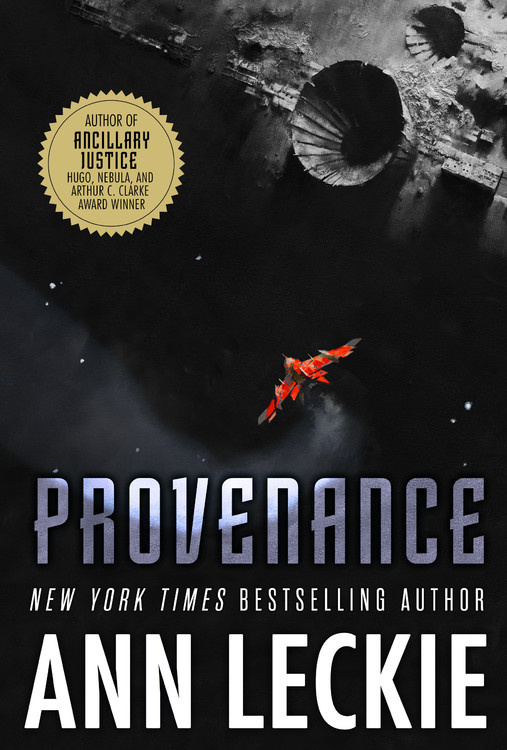 Provenance is set in the universe of Ann Leckie's earlier Imperial Radch trilogy, but only connects with references and by association. This is not Breq's Story 2.0. This is the story of a young woman, Ingray, attempting to run a pretty significant con in order to impress her mother, the matriarch of the Aughskold family. She's a bit out of her league on this one. There's something about hiring a company to rescue a disgraced member of a rival family out of a prison planet called Compassionate Removal with the hope / assumption that he will be willing to embarrass his family and help hers by providing her with stolen "vestiges" from his family. A word about vestiges. Vestiges are highly valued historical documents and items, which could range from documents similar to a Declaration of Independence or the American Liberty Bell to an original copy of a famous speech or perhaps some sort of miscellany from some long ago gala where someone famous appeared. The older and the more historical the vestige, the more valuable and the more important the vestige. Vestiges can, in some respects, represent the identity of not only a family, but the heritage of of an entire world. So, what happens when some of the most significant of them are quietly called into question? The first opening chapters of Provenance are perhaps more compelling in the wake of a murder which occurs a quarter of the way through the novel and in light of the increasingly breakneck pace of the second half of the novel where Ingray comes into her own as a character doing the right thing because it is, in fact, the right thing (mostly). Prior to that, she's working for a vaguely defined personal goal. But, Leckie raises the stakes with the murder and the question of the true provenance of the vestiges. Her examination of family and cultural identity mixed with the lies and myths people tell of who they are is striking. I don't know that Leckie is definitively making a broader statement outside of the novel about how we create our own mythology based on the documents and history we revere, but Provenance has plenty to say about it. It is through its own vestiges that a nation defines itself. America's obvious vestiges are the founding documents, but that national definition also includes Dr. King's Letter from a Birmingham Jail, the Liberty Bell, artifacts from the Apollo 11 mission, and anything that helps create the myth and identity of the United States. One thing I wondered about reading Provenance was how the importance of a vestige could ultimately overshadow the truth and mythology of that vestige's origin story. If there are no questions that an event occurred or what the text of a particular document / speech might be, is it truly important that after hundreds and thousands of years that an original vestige necessarily survive the passage of time? It is history and it is heritage, but is there a point where the original of something could be over mythologized and be invested with too much importance? I'm not sure if a historian can answer yes to that question, but with the fetishization of vestiges in Provenance it is something worth considering. That fetishization is at the heart of Provenance because each of the supreme value the major families of Hwae place on the vestiges in their collections and how world itself defines itself based on those vestiges. It is that importance that drives the narrative forward, beginning with Ingray's plot to pull a rival out of Compassionate Removal in order to recover his family's vestiges for her own and then moving into a much large consideration to the veracity of nearly all of Hwae's vestiges. Expectations are one hell of a thing. Ann Leckie wrote three incredibly well received and well regarded novels, the first of which, Ancillary Justice, won almost all the awards it was eligible for (including the Hugo, Nebula, and Arthur C. Clarke). Ancillary Sword and Ancillary Mercy met and perhaps surpassed the high bar Leckie set with Ancillary Justice. With her debut trilogy this exceptional, the hype and anticipation build, the expectation for just how good the next book will be bursts through the roof and settle somewhere near the stars. The next book becomes of the most anticipated novels of the year, of almost any year. So, when the opening chapters of Provenance do not immediately reach and exceed that expectation it feels like a disappointment. It's not fair, because Provenance is not Ancillary Justice nor is it supposed to be. Provenance is very much its own novel, but I just needed to get past a sense of dissonance through those early chapters and figure out what sort of novel Provenance is on its own. The callbacks to the larger Ancillary / Radchaai universe were both delightful as well useful in centering the limited way Provenance connects and fits into the larger tapestry. That's the initial hook here, seeing where and and how Provenance fits. But once that hook is set, the interplay of truth and lies and cultural identity is where Leckie makes her strongest mark with the novel. There's so much to chew on with the vestiges that it does, ultimately, drive the narrative and shapes the reactions of Ingray and Pahlad, as well as the intense family dynamic of the Aughskold family. An entirely separate essay can be written about how families work on Hwae, the value the family head places on performance and ingenuity, and how that impacts Ingray's actions and those of her brother Danach. The idea of provenance through families entirely filled by adoption is a fascinating one and is a rich part of the tapestry of the novel. If so few are born to a family, what does it mean to belong when you are plucked out of poverty and raised to a new family in a life of luxury, privilege, and power? Bonuses: +1 for Leckie's light touch in connecting Provenance to the wider Ancillary universe and showing another facet to the cultural diversity contained within. It's not all Radchaai, folks. Nerd Coefficient: 7/10, "a mostly enjoyable experience". See more about our scoring system here.